The Kalee Pedal Tractors will be returning for Christmas and we are taking pre-orders now. 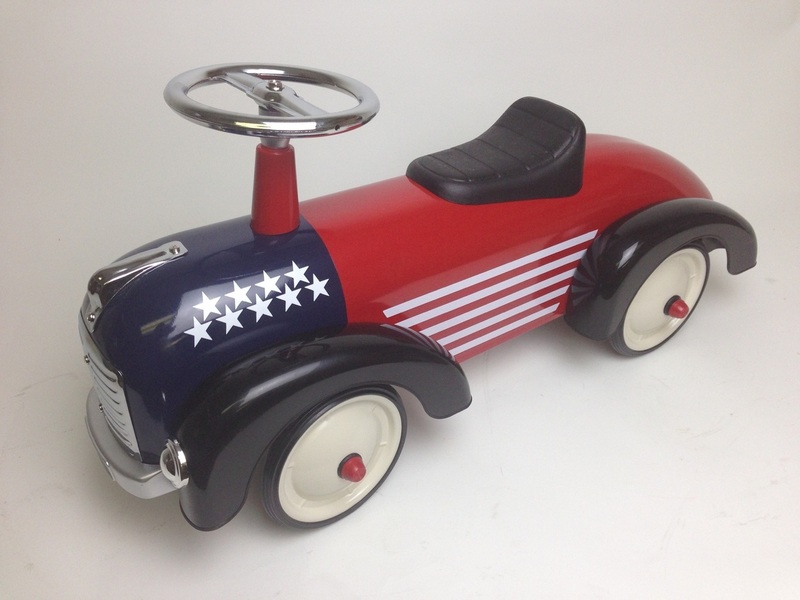 The below Pedal Cars have been deeply discounted for Memorial Day Weekend! Hurry, these won't last long! Sale ends Monday, 5/31/2017, 11:59PM Central Time. Kids and adults of all ages have a ball on these Roller Racers. Order one now for Christmas delivery. Place your order by early this week to guarantee Christmas delivery. Most items go out on the same day ordered. A few of our pedal planes have sold out for the year. If you are planning on ordering a pedal plane for your child or grandchild, we suggest placing your order soon. We can have your plane shipped out by Monday. We also carry scootalong planes for toddlers too young to pedal. One of these would look beautiful under the tree! Your child too small to pedal? Consider one of our scootster trains. Here are two of our trains, the Santa Fe and the Amtrak. The price for the MotoTec Wheelman V2 50cc Gas Skateboard has dropped considerably, to $559 shipped! It is available in Black or Silver. There is also a new swivel front end which makes it easier to ride. Christmas is just around the corner! Please be advised there is no guarantee these items, and any on our website, will be in stock for the holidays. NEW Wooden Pedal Car Kit! We have just added a new Wooden Pedal Car Kit that works with the Pedal Car Chassis Kit. 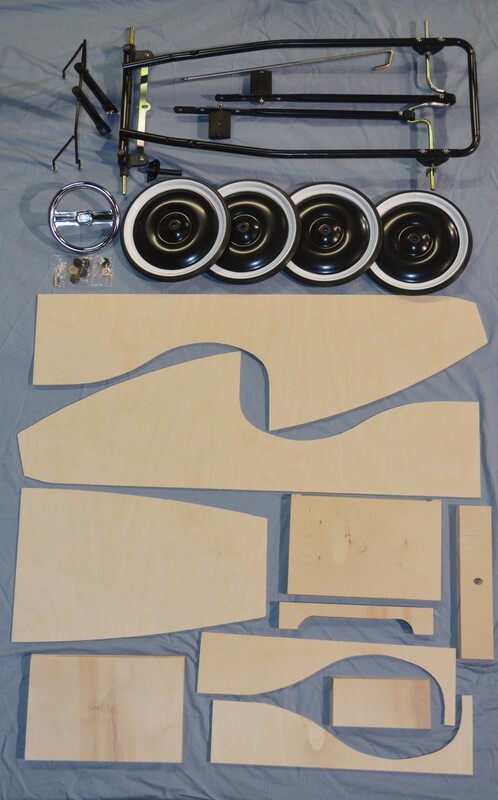 You can purchase the wood kit and chassis kit individually or as a set on the Complete Pedal Car Wood Kit product page. 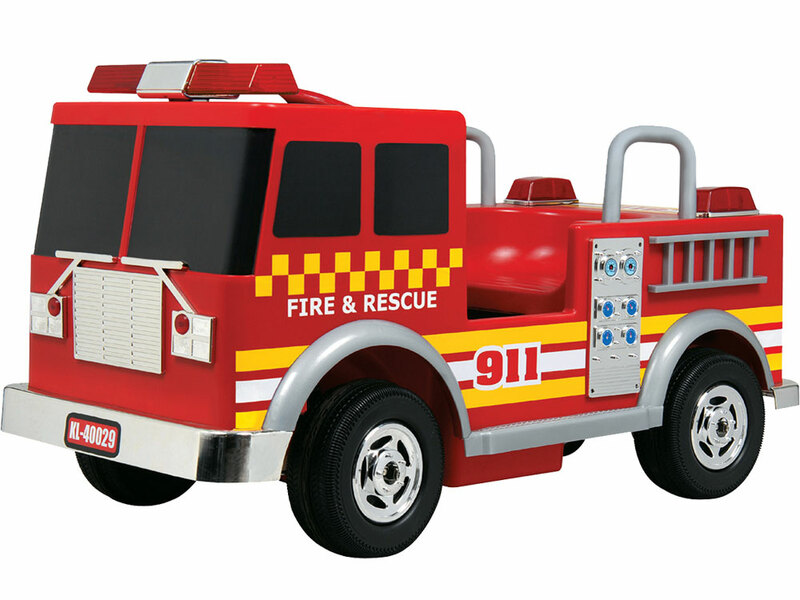 The Kalee Fire Truck is back in stock! Check out the new USA Speedster! In stock now and ready to ship. 1955 Pedal Cars Are In! We are very happy to announce that our 55 Classic Pedal Cars are now back in stock. We have the Aqua/White, Red/White and Black w/flames. The Scoot-Along Eagle Bi-Plane is back in stock and they are already moving fast! We suggest getting your order in as soon as possible. Roadsters Pedal Cars Have Returned! We have six new Comet pedal cars in stock and ready to ship! Models include the Pink Comet Car, Black Hot Rod Comet Car, Fire Engine Comet Car, Deep Burgundy Comet Car, Yellow Taxi Comet Car, and Police Comet Car. Check out our go-cart page. We have added many new pedal karts! These pedal karts are all made in the USA. Popular Pedal Cars Have Arrived! The 1955 Classic Pink Pedal Car and the 1955 Black Sidewalk Cruiser Pedal Car are back in stock! We suggest ordering well before December to guarantee these get found under the Christmas tree. Also back in stock are the Speedster Fire Truck and the Yellow Speedster with Flames. These are perfect for baby's 1st Christmas! 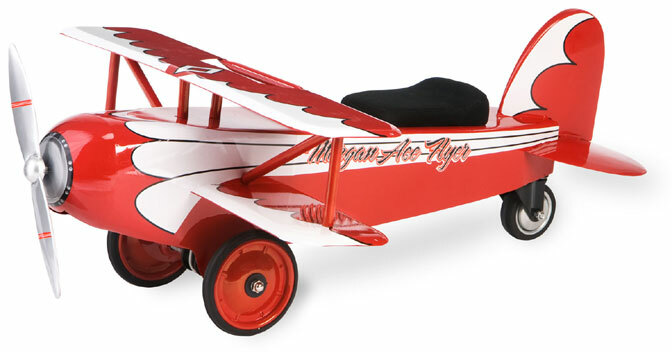 The Silver Eagle Bi-Plane Scoot-A-Long is also back in stock. 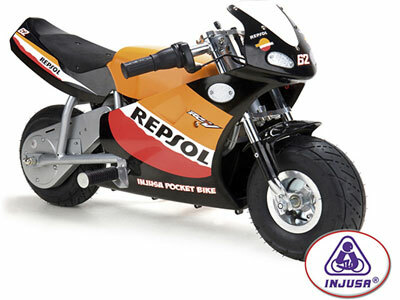 The very popular Injusa Repsol Wind Motorcycle 6v and Motocross Thunder Max VX 12v are back in stock! These are sure to disappear well before the holiday shopping season gets under way (hint, hint). 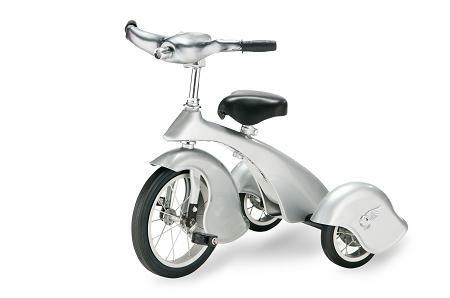 This Silver/Chrome Retro Tricycle by Morgan Cycle is just too cool for words. 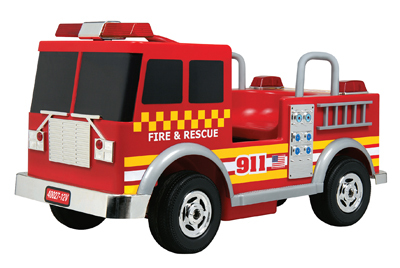 The Kalee Pedal Fire Truck is a popular holiday gift for the little ones. We have a battery-powered version, too! We've added a new John Deere Girl's 12" Pink Bicycle. Go check it out! We also have a John Deere Girl's 16" Bike in stock, as well as Boy's 12" and 16" John Deere Bikes. A new Silver Bi-Plane Scoot-Along Ride-On has just been added. Also, the Scoot-Along Speedsters are all back in stock, including the popular Speedster Fire Truck, the Yellow Hot Dog Speedster with Flames, the Pink Speedster, and the Silver & Red Speedster Racers. Also back in stock is the 1934 Black Hot Rod Jalopy Pedal Car. 1955 Classic Pedal Cars Are In! The long-awaited, very popular '55 classic pedal cars have arrived and are ready to ship! The 55's now have an improved steering system, a new pedal mechanism and an improved perimeter frame. These changes help to make the 55's have smoother steering, a sturdier frame and overall just more solid. Some other changes you can expect to see is that the Red/Beige 55 is now Red/White. Also, the seat padding on all of the 55's is now a very attractive dark brown. These changes have been made to improve the quality of our 55 Classics but still keep them cost effective. We know you will like them as much as we do. If you want one of these under your Christmas tree this year, you better place your order now! The 1955 Classic Pedal Car (Aqua & White) is due to arrive within the next week or two. We have just added more ride-on toys to our Under $100 product page. Check out our product we just reduced! Many clearance items have been added. Just in time for Independence Day coming up in about 2 weeks, the Patriot Tricycle by Dirt King! The Dirt King Patriot Tricycle has taken on a special look with all the same features plus a few more. You are getting the same tough built Dirt Bike trike but we've given it a Patriotic face lift. The red and blue frame with white wheels stands out in a crowd. We've added a bunch of white stars and some really cool red, white, and blue streamers. The Evo Scooters have arrived! We have several gas and electric powered scooters to choose from, including the new Evo 2x Big Wheel 50cc Gas Scooter. We have just added a new old-time gas pump to our collection of gas pumps. Check out our new red Mobil Old-Time Gas Pump. Remember when gas was only 18 cents/gallon? Maybe not, but our red Mobil old-time gas pump with working clock and light makes a great decorative piece. Looking for a toy gas pump? Then check out out Toy Gas Pumps page. At 2 1/2 feet high, our authentic-looking toy gas pumps are just the perfect size for pedal cars. The perfect gift for pedal car lovers of any age! The Injusa 24v Pocket Bike is back! This was previously one of our best sellers. The Big brand items have also arrived, including the Linde Forklift and Big tractors. Fill your house with foods that are both delicious & nutritious (fruits, vegetables, whole grains, nuts, beans, fish, lean protein, reduced-fat dairy products) & don't bring home junk food (cookies, cakes, sweetened cereals & sugary drinks). Save treats for special occasions. You don't have to give up sweets entirely, but go out for them instead of having them at home. Avoid fast food. A study showed overweight teens consume about 400 more calories on a day when they consume fast food compared with a day in which they don't. Make physical activity the focus of the home instead of television. No TV in the kitchen or bedrooms. Give children the basic tools to be active: jump ropes, balls, Frisbees. Encourage them to dance, an excellent activity. When they are having fun, they are not thinking about it as exercise. First lady Michelle Obama, at a meeting of the U.S. Conference of Mayors, called obesity an epidemic and one of the greatest threats to our healthy and economy. She has launched a major initiative to combat this problem in childhood. Her Let's Move campaign involves the government working with local communities to provide more nutritious food in school, allow more opportunities for kids to be physically active and give more communities access to affordable, healthful food. Statistics show 32% of children are obese or overweight. Almost 20% of children ages 6-11 and 18% of those ages 12-19 are obese. Such children are at greater risk for weight-related health problems and have an increased chance of becoming obese adults. These numbers are startling, to say the least. We wish Mrs. Obama much success in her new initiative. Of course, healthy habits start at home. 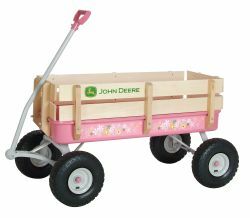 We, as parents, should all be working on forming good habits at home to benefit our children and their future, as well as the future of the U.S.
New Pink John Deere Toys For Your Little Girl! We have just added two new John Deere ride-on toys that you are sure to love. The John Deere 36" Pink Stake Wagon and the John Deere Steel Pink Wheelbarrow. Adorable items for that special little girl in your life! A very limited number of White Classic Luxury Cruisers (Battery-Powered) are available now. Many of you asked about this classy ride during the Christmas rush. It's a little late, but it's here. This cool battery-powered car would make a great Valentine's or Easter gift! 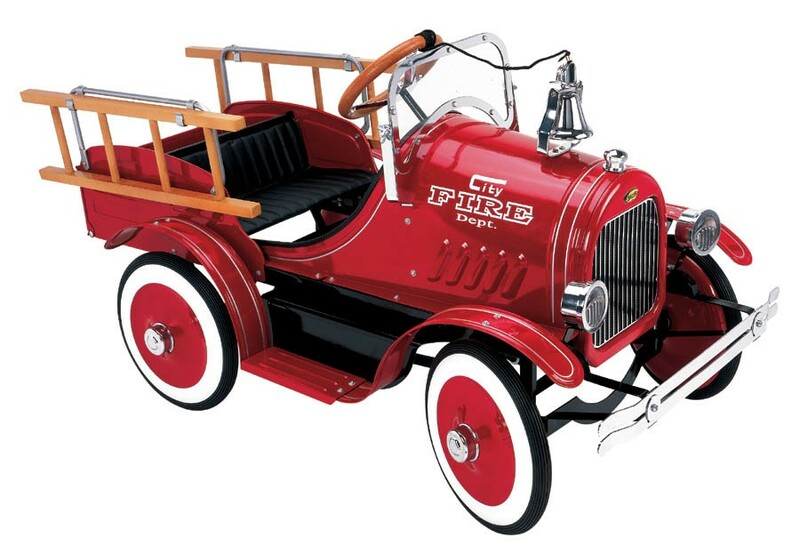 Limited Edition Volunteer Fire Truck Pedal Car by Gearbox has been DISCONTINUED! However, we have just ONE in stock! There is the LAST UNIT of its kind available. Get it before it's gone! We also recently added the Speedgo 40cc Gas Powered Skateboard. The Speedsters (Fire Truck, Red, Pink & Silver Racers, Yellow Hot Dog w/Flames), Black Route 66 & Red Gas Pumps & Pedal Car Kits are now in! FFT101 Authentic (Velocity) Pedal Fire Truck Is In! Our most asked about fire truck is finally in, the new and improved Authentic (Velocity) Pedal Fire Truck!! This firetruck has lights on both the front and rear and features 2 different fire engine sirens. Also includes a horn and sprayer sound feature. New model also gives the child an additional 3 inches of leg room as opposed to the older model. Coming next week is the 12V battery-powered version of this fire truck. We are now taking pre-orders. 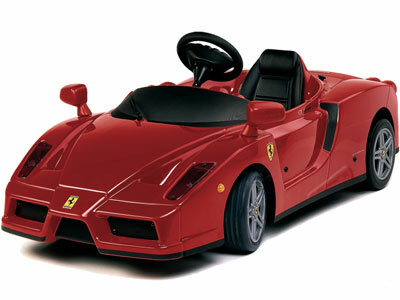 Toys Toys Battery-Powered Sports & Luxury Cars Are In! If you have been waiting on the Toys Toys battery-operated cars (Ferrari, Mercedes, BMW, Jaguar, Porsche, Lamborghini, and others) to arrive, they are now in! We do strongly suggest placing your order now. Most of these sell out well before Thanksgiving even arrives. The New FFT101 Authentic (Velocity) Fire Truck Is Coming! Our most requested Authentic (Velocity) Pedal Fire Truck FFT101 is coming soon! Many of you have asked when we'd have the new firetruck in stock and we're happy to inform you that they are right around the corner. As many of you know, the past model was discontinued and a new unit was redesigned with a new manufacturer. The new firetruck will be better quality with a more updated design. We will also have a battery-operated version of this same firetruck available for this holiday period which will be of 12V power! We will provide all the details/specs of these two new fire trucks over the coming weeks. We expect the pedal fire engine to arrive no later than Oct. 31st and the battery operated fire truck to arrive no later than Nov. 15th. The water spraying feature was removed from this new model since the water components on the last unit were the #1 reason for customer complaints. We do plan on having a backpack water sprayer that can be bundled with this item. Once we get specifics on delivery dates for this item we will let you know. 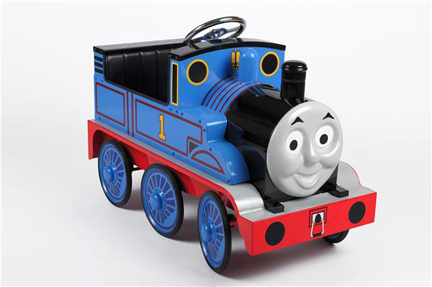 The NEW Thomas the Tank Engine Metal Pedal Train Is Here! 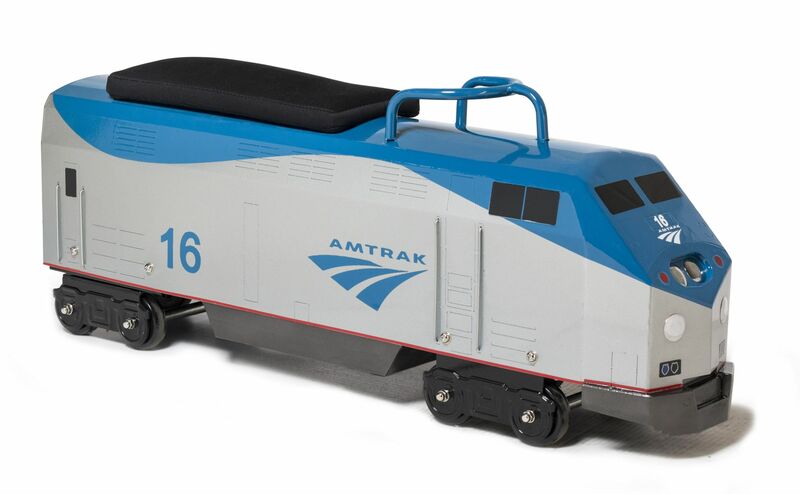 Be sure to check out the new Thomas pedal train that just arrived this week! This famous blue train is sure to be a hit with both kids and adults alike. 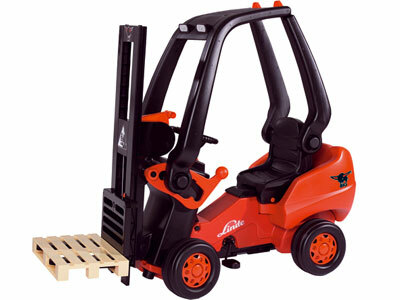 The much-awaited Linde Pedal Forklift is due to arrive next week! This pedal ride-on is definitely one that is hard to keep in stock. We have added several MLB pedal cars for our baseball fans. What better way for your child to cheer for their beloved MLB team than driving the officially licensed pedal car! Our pedal cars support the physical wellness of your child and an opportunity to support their favorite MLB team. Our cars are pedal powered allowing your child to pedal the car both forward and in reverse. Your child will pedal their heart away while racing towards another championship in this cool ride-on toy! We are celebrating Earth Day by offering all of our customers 10% off our earth-friendly ride-on toys. Just use the discount code EARTHDAY2009 at checkout. This coupon is only good now thru Earth Day, so start shopping now! Mini Motos Battery-Powered Vehicles Back In Stock! Our Mini Motos ride-on toys are all back in stock! Many of you have especially been asking for the Car Bug and the Classic Car, both now with parent remote control feature. Check out our new Sports Car 2-Seater! It's sure to be a hit! Sports Car 12V Two-Seater (Red, Silver) NEW MODEL! Our Toys Toys battery-powered ride-on cars were delayed a bit due to the new CPSIA laws. ETA is 2-3 weeks. We will start taking pre-orders shortly! The pretty pink Fantasy Flyer Pedal Plane was recently featured in Cookie Magazine. Check out their 10 Best Ride-On Toys article . The pink pedal plane that was used for this photo shoot is being sold at $50 off the SALE price -- that's $387.00 with free shipping! This adorable pink pedal plane retails for $529.00. If interested in this awesome deal, please email us at info@pedalcarplanet.com. Feber power ride-on toys have arrived! Chrome Pedal Plane is Coming! 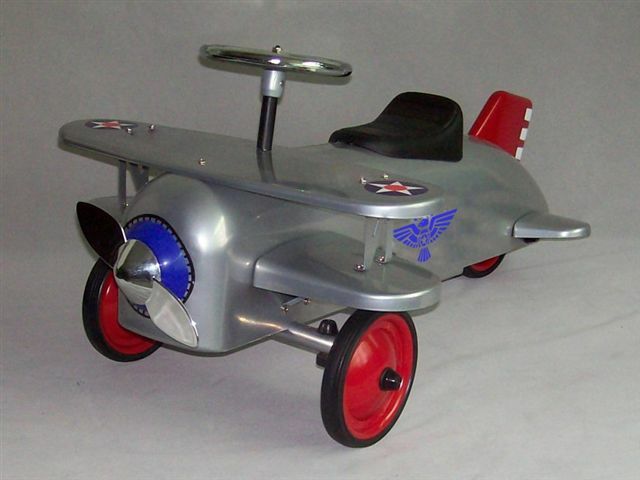 We are happy to announce that the very popular All Chrome Pedal Plane is arriving approx. 11/20/08 and we are now taking pre-orders. MANY of you have been inquiring about this adorable plane. We have been waiting for its return for well over a year! We strongly recommend placing your order now before they are gone! days until Christmas! Now is the time to act!! Kids' ride on toys are great purchases. You will find them cute and adorable, durable and strong, actually usable by your children and grandkids, and very low-maintenance. Furthermore, it never hurts to have a nostalgic item in your household. But that is getting ahead of the story. Kids' ride on toys have a rich history stretching as far back as the 1890s, when the Daimler was sold. Pedal cars were often the exact miniature replica of the real cars on the road, from their front grilles to the rear fenders. The pedal car is as much an icon as its full-sized counterpart, especially the Model T and the roadster models. You can be part of this rich history when you own a pedal car. Just make sure that the model you choose has a history of its own worthy of telling your grandkids. If you are lucky to find an antique pedal car today, you will be treated to working horns and lights, clear windshields, movable ragtops, exquisite chrome detailing, delicate hood ornaments, and white wall tires set in an all-steel body with a custom paint job. Two words - iconic cool! You can display kids' ride on toys under the Christmas tree, or in its own special case in the living room, or in the library, or anywhere you want. It is a fantastic addition to your collection and to your decor! With their exquisite details and glossy finishes, complemented by opening hoods and trunks and even detailed engines on older models, kids' ride on toys are fast becoming collectors' items. And who would not want one of their own? It is very beautiful item of the past, which has value in these automobile-crazy times. Did you know that old models of pedal cars in good condition sell for as much as $2,000 on the market? This is not to say that you should sell for the money but pedal cars are an investment, too. Pedal cars take you down memory lane. They are nostalgic reminders of younger, happier, more carefree times when you can put the top down, go on full speed, savor the wind on your hair and imagine that you are across the country when all you really crossed was the neighborhood street. Because of the durable construction, in olden days from steel and in modern days from molded plastic, kids' ride on toys can be passed from one generation to the next. With proper care and storage, you can witness the joy of riding pedal cars from yourself to your grandkids. In a sense, you have preserved a legacy of enjoyment and fun. If these reasons are not enough to convince you to own a kids ride on toys, then the sheer pleasure of looking at a perfect miniature of your dream cars - a Ferrari F430, a 1932 Roadster, a 1965 Mustang, and a 1965 Shelby GT-350 perhaps - at a very small fraction of the full-sized cars' cost should do the trick. At least then you can boast of having a garage of your dream cars! The outdoor playsets are for your children. But the kids' ride on toys is both for you and your children's pleasure. Find them all at RonJuneShop.com when you visit them today! Big Pedal Tractors On Sale! 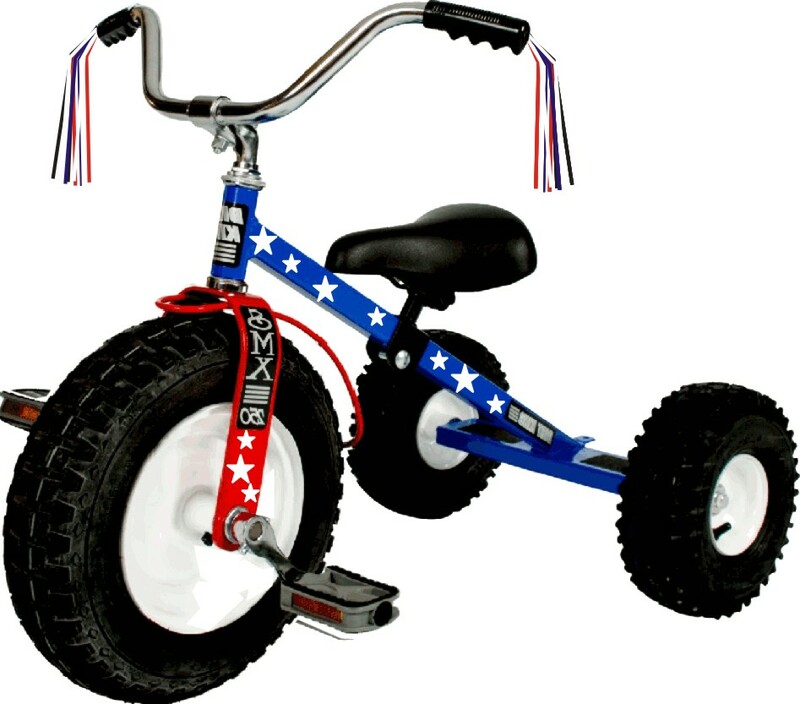 The following Big pedal ride-on toys are now on sale, most of them $50 off! Get these pedal tractors while they last! Big John Traffic Loader Was $189, NOW $139!! Big John Gardener Was $169, NOW $119!! Big Farm Star Pedal Tractor Was $179, NOW $129!! Big John Loader 2nd Gen Pedal Tractor $120 Was $219, NOW $169!! Big Diggi-Backhoe Trailer $50 Was $99, NOW $79!! NEW! Bigger Pedal Cars Just Added! We have just added Henry Pedal Cars to our site, the largest pedal car currently made and suitable for children aged 3 – 9 years old! It’s constructed of solid steel and powder coated in a tough scratch resistance finish, with adjustable pedals and solid rubber tires and trimmed with chrome grille, windshield & steering wheel. This will be a classic for you, your children and grandchildren. We also have Henry Pedal Pickup Trucks and Fire Truck. The Classic Pick-up features solid steel construction, durable powder coat, adjustable pedals, added storage space with opening rear section and rear mounted chrome grab rails, chrome grill, windscreen & steering wheel. The Henry Fire Truck shares the same construction with these added features: chrome ladder racks, wooden ladders, chrome bell, unique decals, padded seat & Claxton horn. Suitable for children 2-9 years old! The Injusa power ride-on toys (cars, motorcycles, go-karts) that was previously out of stock are now back! If you are interested in one of the below popular vehicles, we suggest placing your order soon. They are in stock and ready to ship out same or next business day! We now bring you the only pedal trains in the industry! Our Pedal Trains are made from 18 gauge stamped steel and are 35" long, 15" wide, weigh 38.5 pounds and have a shipping weight of 44 pounds. 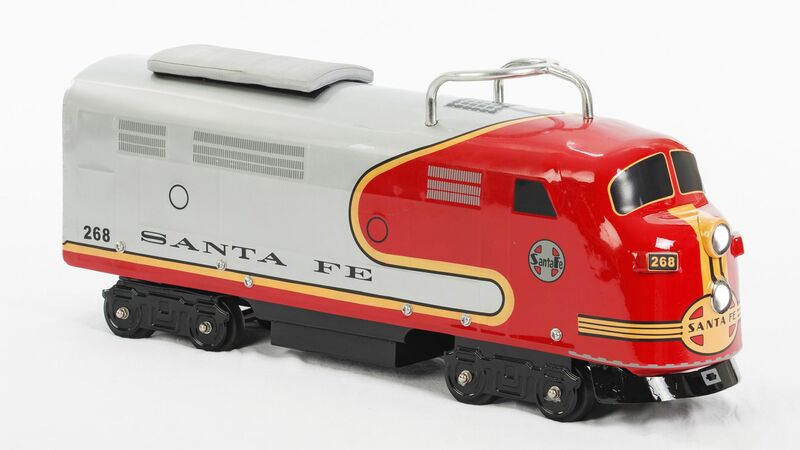 These trains have classic style, suitable for children 3-6 years, and feature solid steel construction, durable scratch resistant powder-coat finish, padded seat, classic graphics, six wheel construction and adjustable pedal mechanism; chrome steering wheel and authentic gauge bezels. No plastic! We have 5 colors to choose from: Red, Black, Green, Pink & Blue! They come fully assembled. Not just a toy, but an heirloom! We've just lowered prices of many of our Berg Pedal Go-Karts as they are being discontinued. They include the Comet, Racer BF-3, Turbo Basic, Tornado 7 Speed, Reflex 7 Speed, Triggy, Chopper AF, Twister AF. If you've been eyeing one of these, now is the time to get it. Once they're gone, they're gone! We also have added a brand new John Deere pedal kart that you may be interested in. Be sure to check it out! We will be adding more go-karts soon! Have you purchased a product from our website? If so, we want to hear from you! Just look for the product you purchased, scroll to the very bottom, and post your product review. As you know, product reviews are very helpful to those considering purchasing products, and thus, very helpful to our website. We will reward you by sending you a 10% coupon code good for any product on our website! So don't delay, post your review now! Our Toys Toys (aka Berchet) battery-powered ride-on vehicles will be back in stock on Monday and ready to ship out no later than Tuesday. We are out of the Mini Cooper vehicles, but have at least 2 left of each of the Toys Toys ride-on vehicles listed below. Gets yours before they're gone! Pre-Order Your Toys Toys Battery-Powered & Pedal Cars - Going Fast! Remember, Spring is just around the corner. The above imported battery-operated cars are very popular and will not last long! Big Ride-On Toys from Germany are arriving today! We are now taking orders for the Big toys (plastic pedal ride-ons) that were on backorder. They should be arriving today and ready to ship out tomorrow, including the popular Linde Forklift, Fendt Dieselross Tractor, Fendt Geratetrager Tractor, Porsche Diesel Junior Tractor, Deutz Fahr Agrotron Loader, Deutz-Fahr Agrotron Tractor, Big Bobby Pedal Kart, and many more. Toys Toys (aka Berchet) electrical ride-on toys from Italy will be arriving early March. We can start taking pre-orders now. The Christmas Shopping Season is in Full Swing! We have been pretty busy processing your Christmas orders. Please be advised that, as we get closer to Christmas, we cannot guarantee that your orders will ship same or next business day due to the many orders we are receiving each day. We are currently shipping most items within 24 to 48 hours. To be sure that you get the items you want for Christmas, we suggest placing your order now! Many of our battery-powered ride-on toys are low in stock, with some of the popular ones already out of stock. We wish all of you a very Happy Thanksgiving with family and friends! We have just added two new tow trucks to our huge line of pedal cars. We know many of you were disappointed when some of our jalopy pedal tow trucks were discontinued, so we added these bigger tow trucks to make up for them. Be sure to check them out! Good news! The popular Toys Toys (Berchet) battery-powered ride-on vehicles below will be in stock tomorrow and will start shipping Friday. If you're one of those that have been waiting patiently for them, now's the time to place your order. They will not last! We now have PlasmaCars by PlaSmart in stock. Plasma Cars come in six different colors: Red, Blue, Yellow, Green, Purple, & Limited Edition Pink. Also, we have lowered prices on many popular Injusa, Toys Toys, and Big battery-powered vehicles and pedal ride-on toys. Be sure to check them out. Our popular Toys Toys (aka Berchet) battery-operated ride-on toys that have been out of stock will be in stock by the end of this month, so watch for them. They will not last, especially with the Christmas holiday just around the corner. We have several new battery-powered vehicles coming soon. Be sure to check them all out! We have also added many John Deere ride-on toys, including pedal tractors, bicycles, and tricycles, with more coming soon. You will also want to check out our other new tricycles. Good news for those waiting on the cute green and black jalopy pedal pickup trucks They're back! Order now before they're all gone! We'd like to announce the expansion of our pedal tractor line. Come see our new additions! We also added tractor trailers. Also, be sure to check out our NEW 1934 Classic Pedal Cars in Red and Black as well as our NEW Velocipede Tricycle. We now have popular items available that had been out of stock for some time, including the Sporty in Red. The very popular Jalopy Pick-up in Green and Black will be back in stock in about a week, but can be pre-ordered now. If there are any products like you'd to see us carry, just drop us a line! We welcome all comments and suggestions. Happy 4th of July! Stay Safe! We want to inform you that the out of stock items many of you have been asking about are now back in stock! A lot of these items will go fast, so order now! We would like to announce the addition of our new Pedal Tractors, as well as other farm ride-on toys, which many of you have requested. You asked for them, and now we've got them! We will be adding more tractors in the near future. We have also added many new scoot-along ride-on toys for the younger kids, as well as self-propelled vehicles for ages 3-12. Some of you may remember the Flying Turtle or the Roller Racer of the 1980s, where you place your feet on the handlebars, grip the handlebars, then swing the handlebars from side to side to make it go. These were very popular in the 80s, and now we've got them! Be sure to browse our website for other products you may have missed. We are adding new products on a regular basis. And don't forget, next Sunday is Mother's Day! Specializing in pedal cars, we never thought this would ever happen. We waited for April Fool's Day to introduce our new product line...Battery-Powered Vehicles! This is no joke. We've added Injusa's Powered Vehicles. Made in Spain, these Injusa ride-on toys are top of the line. We've also added Toys Toys Ride-On Toys, including the popular Mini Cooper, Mercedes SL, and VW Beetle. Check them out! If there is anything you'd like to see on our website, just let us know. We have also added classic coolers to our site, a product we feel make a nice addition to our website: Retro Coolers. And remember, we offer free shipping on all our products! And last, but certainly not least, we'd like to ask you for pictures of products you have purchased from us, with the happy owner riding them, of course. Any comments you have about our products and service are also greatly appreciated. We plan to post customers' pictures and feedback on our website soon. We have just added approximately 30 new products to our website, including Sad Face Pedal Cars, Pedal Racers, Pedal Planes, and All-Chrome products. We are very excited about our new products and know you will be, too.